A European research consortium, in which the University of Bern is involved in, wants to drill a 1.5 million year old ice core in Antarctica. An analysis of the climate data stored in the ice should contribute to a better understanding of the alternation between warm and cold periods. As part of the EU project "Beyond EPICA – Oldest Ice", experts from 14 institutions located in 10 European countries have spent three years combing the Antarctic ice sheet to find the ideal location to retrieve the oldest ice core on the Earth. The location has now been found and the consortium presented their choice today at the annual conference of the European Geoscience Union (EGU) in Vienna. Sunny day at “Oldest Ice Reconnaissance” field camp in Dronning Maud Land. Drying laundry and sleeping cabin. 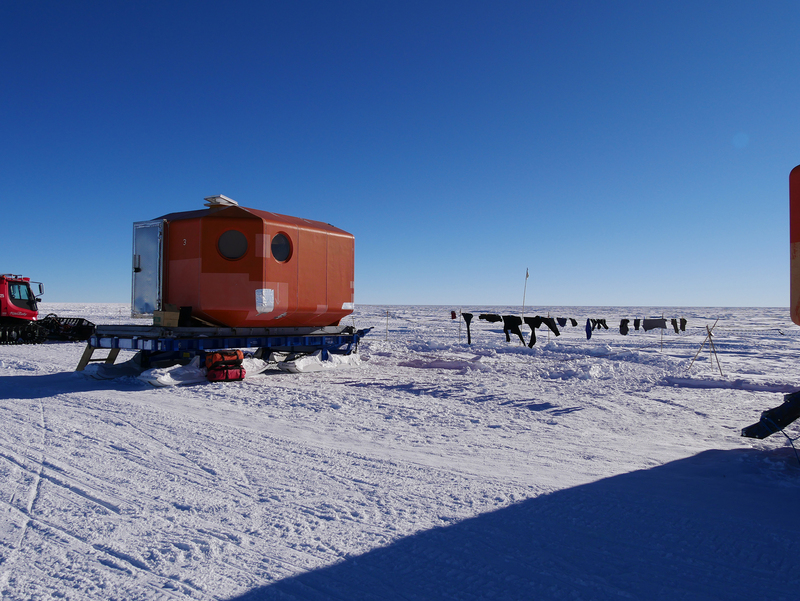 The research team selected one of the most barren and lifeless places on Earth: "Little Dome C" is located around 30 kilometers – or a couple of hours by snowmobile – away from the Concordia Research Station, which is jointly run by France and Italy. The station is 3233 meters above sea level, it experiences extremely little precipitation and the average annual temperature is a chilly –54.5 °C?. The temperature never rises above –25 °C? and can drop to –80 °C? in winter. The Concordia Station has played an important role with regards to climate research in the past. As part of the EPICA (European Project for Ice Coring in Antarctica) project, between 1996 and 2004 researchers drilled to a depth of 3270 meters into the Antarctic ice at this site. Using a detailed analysis of these ice cores, the University of Bern was able to reconstruct the CO2 concentration in the atmosphere over the past 800,000 years – a world record. "This time interval is characterized by ice ages that were interrupted by relatively short warm periods, like the one that we are currently experiencing, every 100,000 years or so", explains Hubertus Fischer from the Oeschger Center at the University of Bern. "The CO2 concentrations also changed at the same time: low values in ice ages, high values in warm periods." Fischer is a professor for experimental climate research and the leader of the Swiss Team taking part in Beyond EPICA – Oldest Ice. 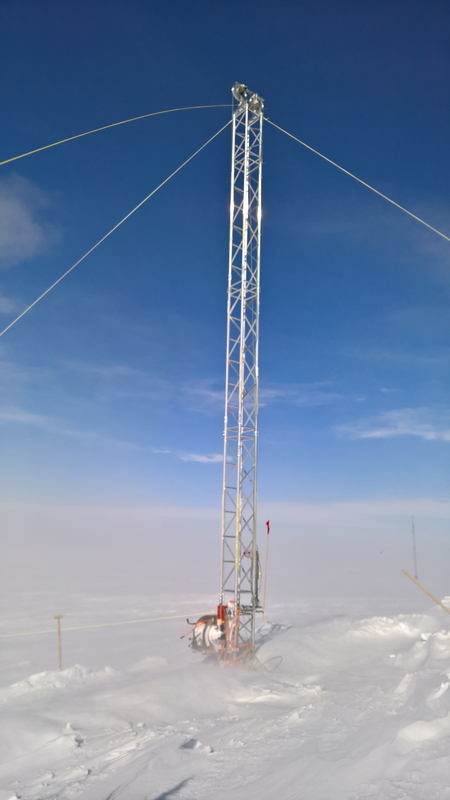 10m height shallow drill tower in the wind close to Neumayer 3. Studies on marine sediments show that around a million years ago, before the period of time covered by the EPICA ice core, there was a dramatic change in this back and forth. In the time before ca. 900,000 years ago, the cycles of ice ages and warm periods were only around 40,000 years long. What caused this change to come about is a puzzle. Climate researchers suspect that greenhouse gases may have played a decisive role. An analysis of the gases trapped in the oldest ice on Earth may be able to solve this problem. "After having analyzed the 800,000 year old samples taken from the EPICA ice cores, we believe that there is good reason to drill into ice that is at least 1.5 million years old in order to get more information", says the coordinator of Beyond EPICA – Oldest Ice, Olaf Eisen from the Alfred Wegener Institute (AWI) in Bremerhaven. Hubertus Fischer’s research group has specialized in the analysis of greenhouse gases in ice cores and will play a crucial role when it comes to the evaluation of the new drilled core. "Using the air enclosed in little bubbles in the ice, we can determine how the concentration of CO2 or methane has changed over time", explains Fischer. Ice cores from Antarctica are the only climate record that can be used for this. In addition, a completely new analysis procedure is currently under development in Bern. The thing that makes it special? It can measure all greenhouse gases at the same time in a single analysis. What’s more, none of the air extracted from the precious 1.5 million year old ice samples is lost during the measurement, instead it can be used for further research work afterwards. If the EU approves the second phase of Beyond EPICA – Oldest Ice as hoped, the deep drilling work will start in November 2021. 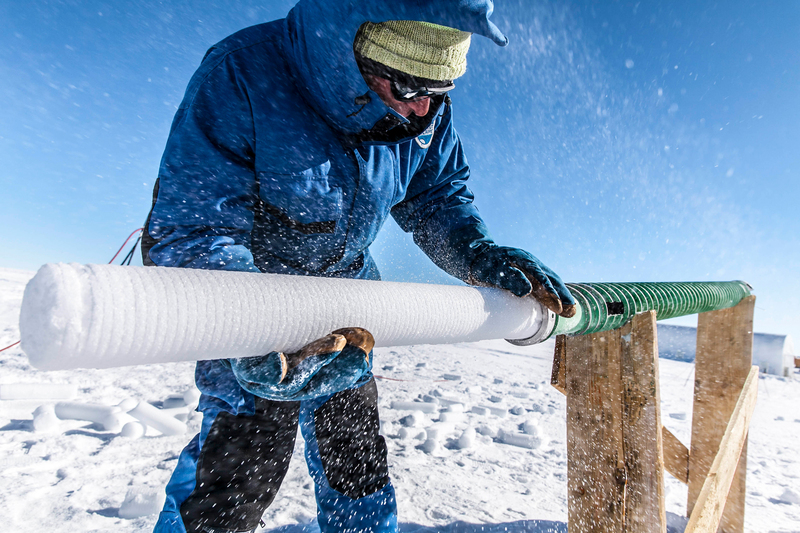 The aim is to gather ice cores with a diameter of 10 centimeters. The drilling will take place from November to the start of February over three Antarctic summers,. By 2024, a depth of 2730 meters, where the ice is at least 1.5 million years old, should be reached. The first results from the analyses should be available in 2025 and will allow the researchers to investigate the connection between greenhouse gases and climate during the “mid-Pleistocene transition period” and the period before.